I probably should have saved this post for April fools day, but I was so excited I just couldn't wait to share it with you! I spend about 90% of my life joking around, so every now and then my desserts have a sense of humor too. These deviled eggs are adorable and taste nothing like real deviled eggs (which I absolutely LOVE, by the way). A light and crispy meringue cookie served as the perfect egg white, while a smooth lemon mousse passes as the deviled egg mixture. 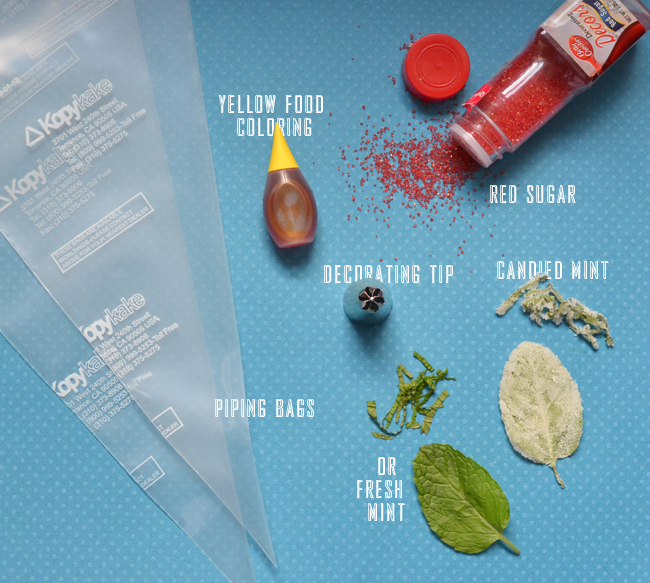 The garnish is the real kicker here, with sugar "paprika" and mint instead of chives. Are you as excited as I am about these?! Can you guys think of any other foods I could fake as desserts? If so, send 'em my way. First, you need to make a lemon curd and fresh whipped cream. Then, you'll turn that into the lemon mousse. 1. 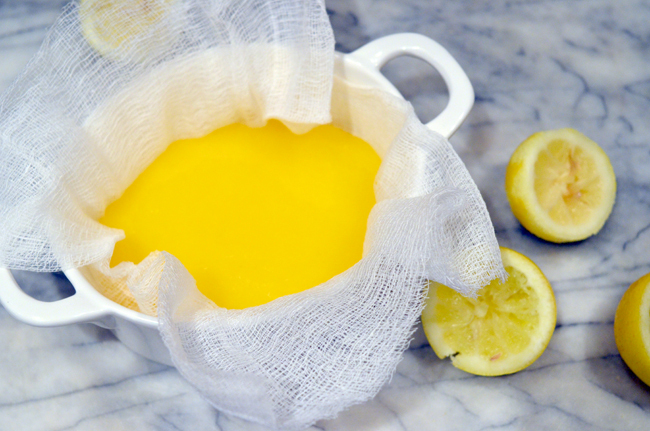 Combine yolks, lemon zest, lemon juice, and sugar in a small saucepan. Set over medium heat and stir constantly with a wooden spoon until mixture is thick enough to coat the back of the spoon, or about 5 minutes. 2. Remove saucepan from heat and strain into a bowl. (Straining the curd is a must! It removes any lumps.) Stir in butter, one piece at a time. Continue stirring until curd is smooth. 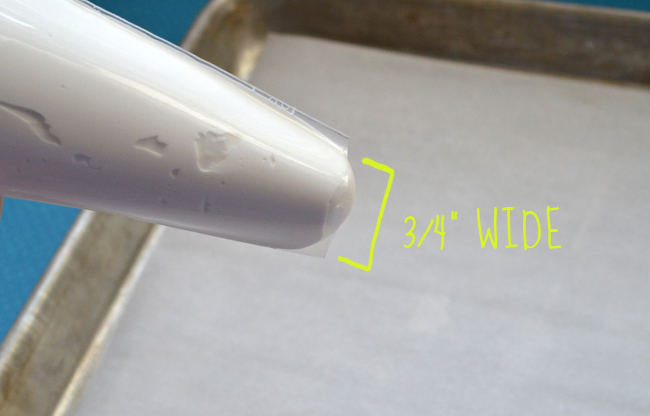 Place a sheet of plastic wrap directly on the surface of the curd and wrap tightly. Refrigerate for at least 1 hour. 3. 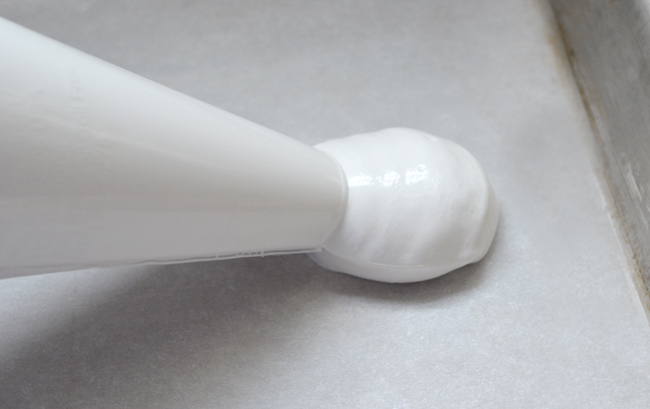 Prepare whipped cream by placing the heavy cream the bowl of an electric mixer fitted with the whisk attachment. Mix on high speed for about 2 minutes, or until soft peaks form. Add the sugar and vanilla extract and mix on high until very stiff peaks form. 4. 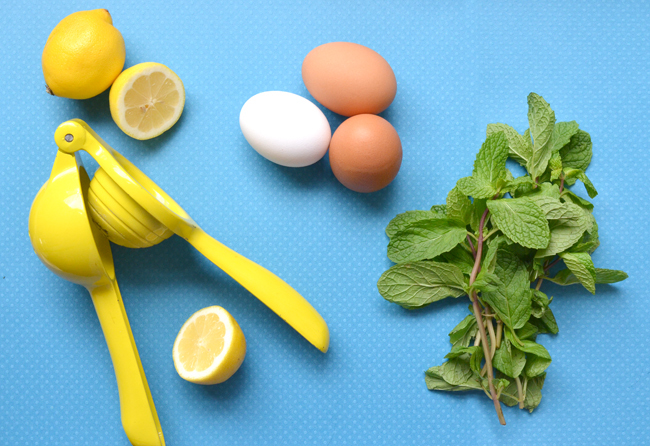 Remove lemon curd from refrigerator. 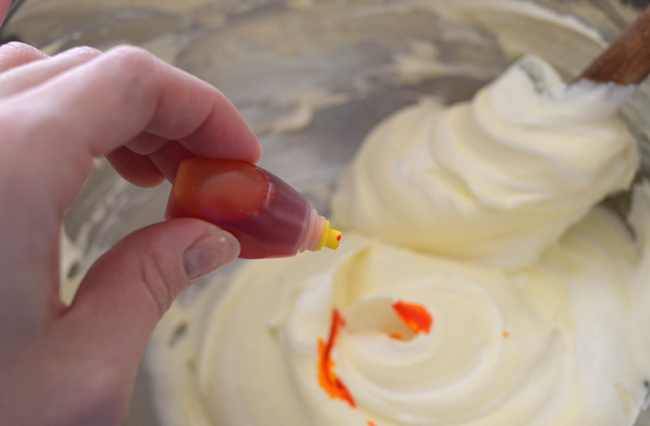 Carefully fold the curd into the whipped cream, making sure not to over mix. 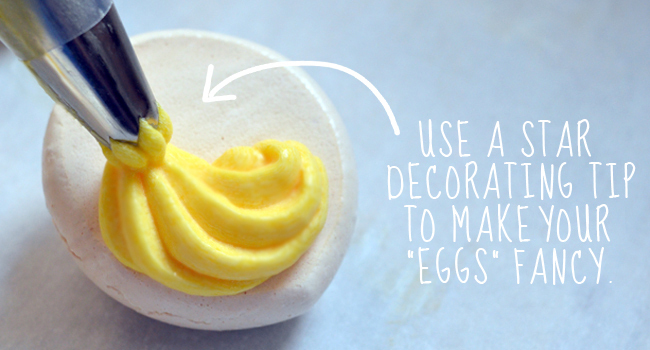 Mix in the yellow food coloring, a few drops at time, until you have the desired "egg yolk" color. Cover mixing bowl and refrigerate until mousse is very cold, at least an hour. 1. Preheat oven to 200 degrees. Line 2 baking sheets with parchment paper. 2. Place egg whites in the bowl of an electric mixer fitted with the whisk attachment. Mix on medium-high speed until white and foamy. Slowly pour the sugar into the bowl, mixing on high speed, until stiff peaks form. Mix in salt and vanilla extract. 3. 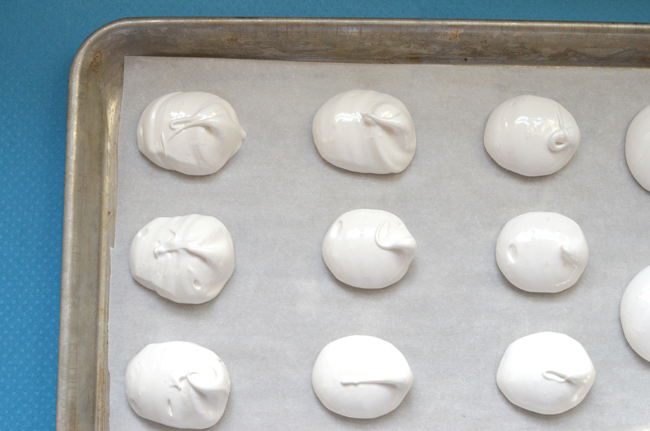 Transfer meringue into a piping bag or a large zip-lock bag. Snip off the tip of the bag so opening is about 3/4” wide. Keeping your hand stationary, pipe meringue onto parchment, creating an egg shape about 2 1/2" long. Repeat until all the meringue has been piped out. 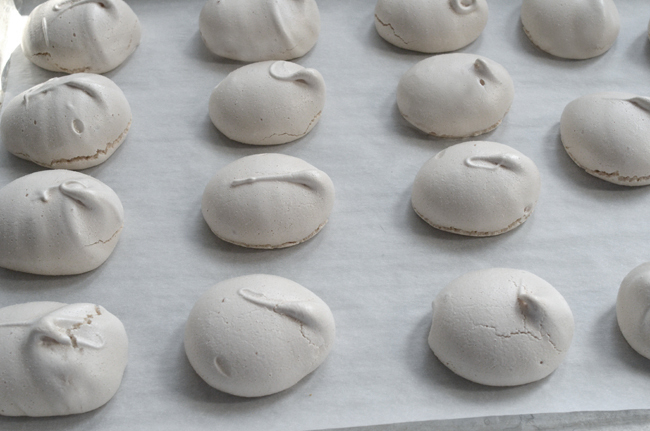 Bake meringues for about 1 hour and 30 minutes. Watch them to make sure they don’t brown. Cool completely before flipping over. 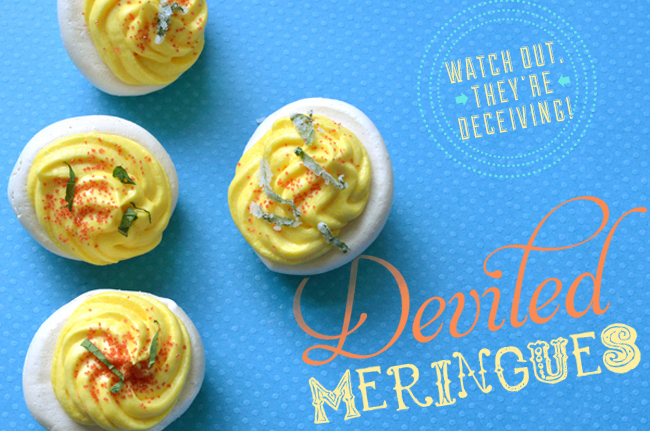 Now, let's make some "deviled eggs!" 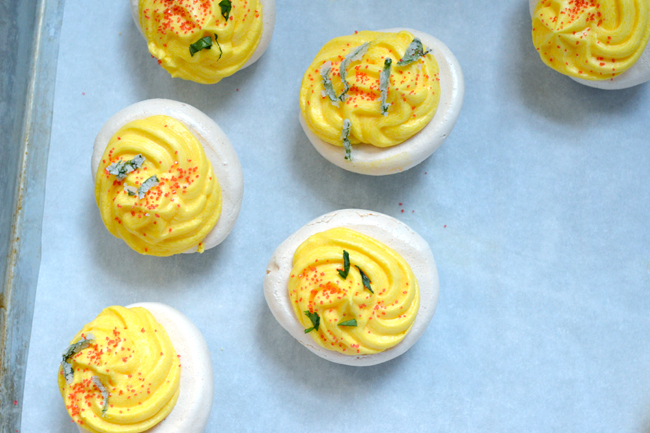 They really come to life with the help of red decorating sugar and mint as a garnish. 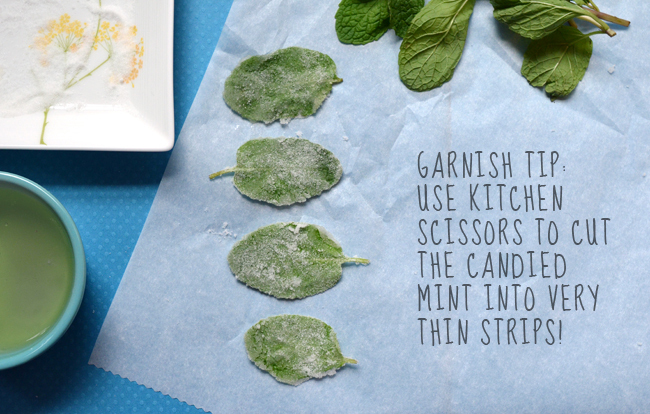 I decided to candy the mint, but you can use fresh mint instead. Make sure to assemble these right before serving, as the mousse can’t sit out for long. 1. Flip each meringue cookie over so the flat side faces up. Transfer the lemon mousse into a piping bag or a large zip-lock bag fitted with a star decorating tip. (If you don’t have a tip, just snip the tip of the bag to make a 1/2” opening.) 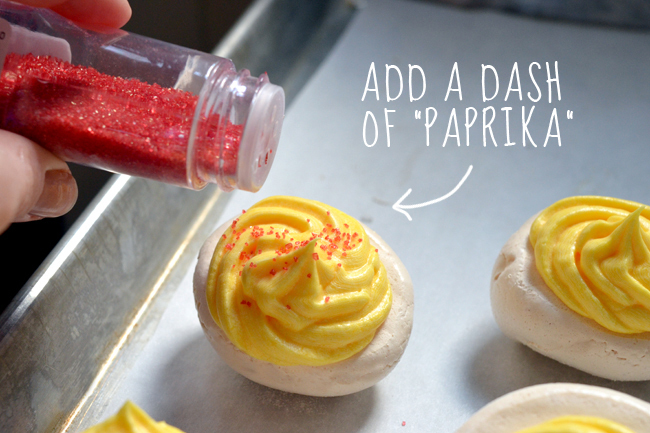 Pipe mousse on each meringue cookie to give the illusion of an egg filling. 2. 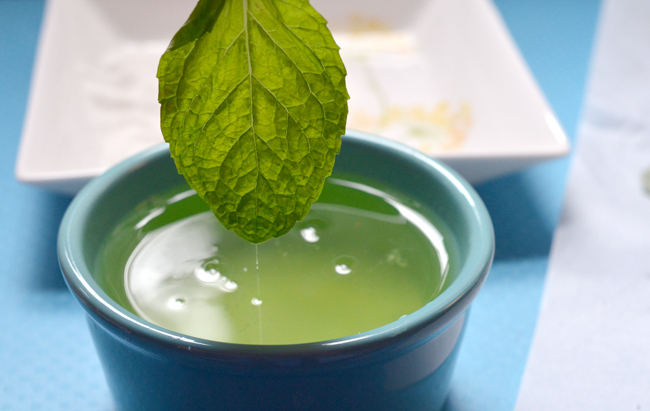 Sprinkle with red decorating sugar and mint. these are so stinkin' awesome it's not even funny. i think my taste buds would have a hard time not expecting eggs, you make them look so believable! what and awesome job. Hi! Yes, you can make most of the parts before your event and assemble the day of. 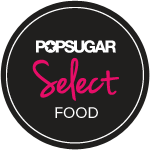 Create the candied mint and the meringue cookies a few days in advance and keep them in airtight containers. The lemon curd (without the whipped cream mixed in) will keep in your fridge for about a week. I recommend adding the whipped cream to the curd the day of, so it stays light and fluffy. It's best to assemble just before serving, because that mousse can get droopy pretty fast in this summer heat. Hope that helps!